Star chaser Poke The Bear scored a stunning win at the Meadows on Saturday night. FAVOURITE backers at the Meadows on Saturday night would have been left scouring the bins at the local pub for their tickets after Poke The Bear came from last-to-first to win in the most remarkable of circumstances. In what could only be described as a roller coaster of a race, Poke The Bear – which jumped as a $1.20 favourite at online bookmaker Sportsbet – was one of the last away and looked out of the race at the first turn after copping a check which saw him get shuffled back to last. 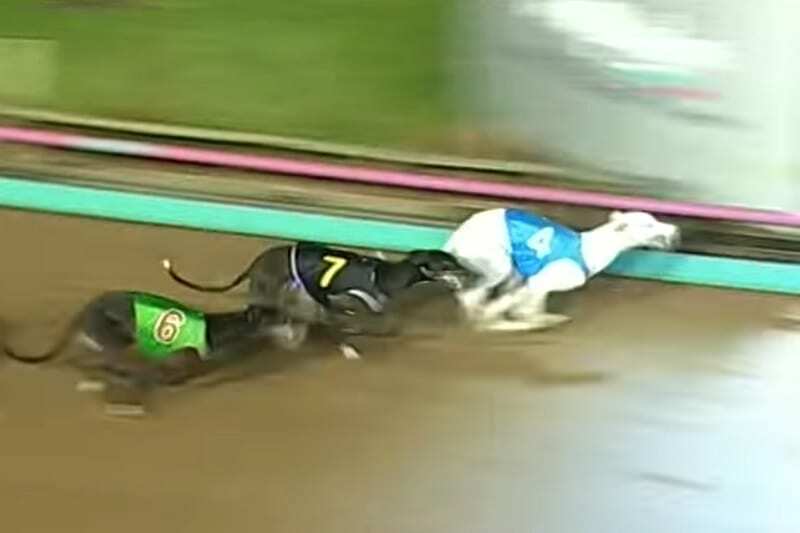 Settling about 15 lengths off the pace, Poke The Bear began to pierce his way through the field, hugging the rails when the opportunity arose as other dogs drifted wide. Still over five lengths from the leader approaching the final turn, Poke The Bear displayed the natural speed and grit that saw him make the 2018 Melbourne Cup final, hitting the front just before the line before streaking away to win by three parts of a length ahead of one of the outsiders of the field Pants On Fire. Poke The Bear is a $10 hope at online bookmaker BetEasy to win next year’s Group 1 Paws Of Thunder, and on that performance there’s no reason to think he can’t salute.